From elite athletes to competitive runners, Randy Ashley Running has helped numerous runners realize and achieve their goals. "The road to becoming a nationally competitive runner was very intensive, and I could not imagine having been able to do it without Randy's patience and understanding. Because Randy approaches training with a balanced and holistic view, I was able to compete in the Olympic (Marathon) Trials while having a demanding profession (fighter jet pilot in US Air Force), and maintain a healthy balance of the two. Having Randy coach me from afar has worked out great, as I have moved four times in the past two years, but still have the consistency of one coach, who really knows me and knows his stuff." "Randy and I have been working together for the past two years. Out of college, I was unsure if further running gains were possible. Fast forward to 2017. I have experienced steady and meaningful improvements in fitness and a heightened confidence in my racing strategy. Randy is very enjoyable to work with and pragmatic in situations that don’t call for a cookie cutter solution. There is not a day that goes by where I don’t see the purpose of a workout. Each planned session is individualized, purposeful, and part of a greater goal. Training is day to day within a cumulative approach of eliciting specific and desired improvements. Randy has helped me become, not a only a better runner, but a more comprehensive student of the sport and dedicated athlete!" 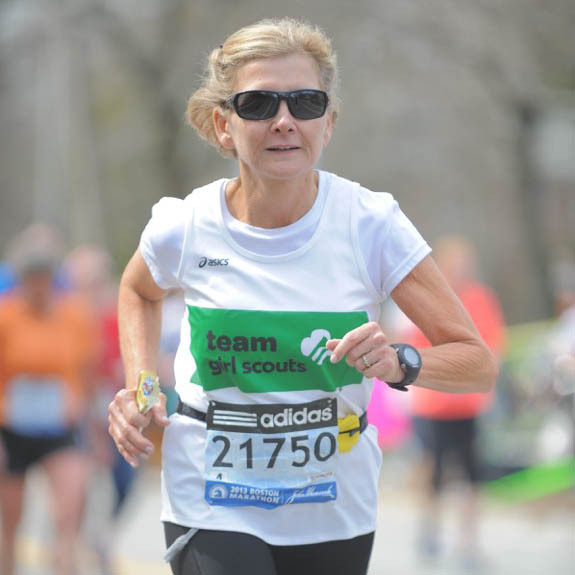 "I started working with Randy in 2012, and it didn’t take long for me to qualify for the Boston Marathon, which I ran in 2013 and again in 2014. I’m on a quest to run all the majors. So far, with Randy’s help, I’ve completed Boston, the New York City Marathon, the Berlin Marathon, and I qualified for a spot at the Chicago Marathon for 2018. Randy listens before he develops his weekly training plans. He listens to how my prior week went, how I am feeling and what else I have going on. Then, he devises a plan to assimilate training into the rest of my life. That approach has worked well for me. For me, having a coach who knows my strengths and weaknesses will make it possible." "I am 62 years old, and had gotten back into running 4 years ago. I was “self-coaching” myself, and I had managed to qualify for Boston. But I was losing motivation, and I felt like I was just plodding along in my training. I was looking for a spark to reenergize my running, so I decided to try a real coach. And Randy has definitely provided that spark. I have only been working with Randy for the past five months...and while we only had an initial abbreviated marathon training cycle...Randy helped me PR at Chicago. It was not just the time that I was happy with, but how good I felt. I never hit the wall! Randy’s marathon program was not slogging thru a lot of 20-milers, but instead focused on high quality workouts which were creative and interesting. I am excited to see how the relationship and training program continues to evolve in future training cycles. I am very pleased with the impact that Randy has had on my running." "Randy is a terrific coach. I started working with him three years ago leading up to my first Boston Marathon. His workouts are challenging, but fun. He does a fantastic job of providing a wide variety of intervals that are focused on my specific goals. I’ve always felt 100% prepared at the starting line after a solid race build up and taper. I’m going into my fourth season with Randy and excited about new PRs to come." "Randy has helped me find success in training and racing through his attentive communication, flexible scheduling, and long term outlook. He crafts training schedules that are both challenging and rewarding. I have been consistently impressed with his ability to write workouts that are exactly what I need in terms of pace, volume, and focus. All I have to do is follow the plan and stay healthy!" "Randy Ashley is a rock star! I successfully finished my fifth marathon and the entire experience was incredible. I'm not a world-class athlete and my goal was to simply run a marathon while feeling strong, steady and ready. My previous marathons had been like a death march because I was constantly injured and over-trained. Using Randy's principles and running plan, this was the first marathon where I felt strong, prepared, healthy and confident. Following Randy Ashley's plan was just what the doctor ordered to get me to the starting line injury-free and equip me with the tools to race well. I couldn't be happier about what we achieved together. By the way, I had a PR by almost 18 minutes! I look forward to seeing what we can do at my next marathon." "Coach Ashley has been coaching me for the past 2 1/2 years, and is a big part of why my times keep going down, and why running is exciting and fun for me. I always know what my running schedule is for the week, and he gives a lot of thought to what I should be doing, so that I don't have to. We talk before every race, so I always have a strategy going in. My goal this coming track season is to qualify for the Penn Relays in both the mile & 2 mile, and to run D1 in college." "Coach Ashley changed my view of running and helped my confidence level. He made me realize my running potential and set higher goals for myself. Within a few weeks of personalized training, I ran a 30 second PR in the 5k. Since then he worked with me to consistently bring down my XC and track times. Because of his coaching and contacts, I now run on Harvard's NCAA D1 XC and Track team!"